You know what we still haven’t gotten around to? That’s right – a “what we would have done differently (or not)” post. That seems almost criminal after over five months on the road, making mistakes and getting messy and learning from so much trial-and-error. I would have loved to read an article like that before our trip. To add some incentive, about two months ago (right as our trip ended), we got a comment from the burrow files asking us for a post on lessons learned. So this is for you buddy. #1 – Choose your vehicle (and interior design) wisely. We picked a minivan for this trip, hoping to find a nice compromise between spaciousness and gas mileage ($$$). Along the way, we saw other minivans, but we were jealous of the gigantic Sprinters. If we were going to live out of a vehicle for the long-long-term, a Sprinter for two people is the way to go. It’s like a studio apartment on wheels. But yeah, they are ridiculously expensive. 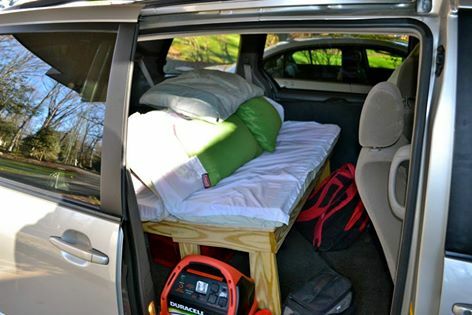 We saw people make do in their Subaru Outbacks, which is cramped but certainly livable for one person. This girl [KP] just started her trip, and she got a pop-up tent on top of her car. One couple we met pulled a T@B camper behind their truck. There are lots of possibilities, and I could never provide the full-spectrum of options that you could get by a simple google search. It’s up to you to decide what kind of set-up will fit your budget and specific travel needs. If you are going to go with a minivan, it’s definitely not a bad choice. It just takes a little bit of remodeling. WHAT WE DID: We had a Toyota Sienna. 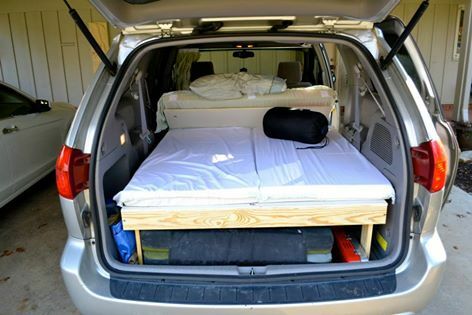 We removed all the rear seats and built a futon-style bed frame with three panels. The back panel lifted up to store two crashpads and our cooking equipment. The middle panel lifted up to become the “back” of the futon while the front panel could move forward and back to transform from “couch mode” to “bed mode.” Underneath the frame we could fit five large plastic bins with all of our belongings. This was definitely livable, but poor 6’2″ Drexel was too tall to sit up comfortably on the couch, and our stuff was difficult-to-impossible to retrieve from underneath the frame while in “bed mode.” It was easy for things to become messy. We had built our design around the concept that we needed space for maximum storage, instead of for comfort and ease of use. That was a mistake. Rear view, while in “couch mode.” This back panel could pull out half-way to provide a table of sorts for cooking, but it wasn’t built sturdy enough and broke half-way through the trip. One design that could have been a better use of the space is this pull-out slat bed. It would have been very nice to have that empty space during the day just for stretching and breathing, since the inside of the van always felt very cramped no matter what “mode” it was in. These slats pull straight out to form a bed, but when not in use, take up much less space and are also useful for storage. With a sofa bed design like this one, we could have invited friends inside on cold rainy nights instead of feeling claustrophobic cramming people on our bed and bumping heads against the ceiling. During the day, we could have had a place to stretch or sit more comfortably. We could have had room for stackable plastic drawers, to increase the amount of easily-accessed items (e.g. clothes and food). We saw a guy who bungee-corded one of these behind the drivers seat and that seemed pretty smart to us. So much good space in a plastic storage tower! That’s all I’ll say about vehicle design. There are plenty of sites with blueprints for building different features into your van or car. It wouldn’t be too difficult to live comfortably and affordably. Just remember that space and comfort are going to be more important than you might initially assume, so plan wisely. Your space should feel like a home, because that’s what it is going to be. #2 – Bring less stuff. A lot less. We had five full bins of stuff stored under our bed: one bin each for cloths or personal items, two bins total for food, and a “fun box” with books, art supplies, etc. With proper planning, we could have managed with NO BOXES. We could have used a 4-bin plastic storage tower for clothing and daily food, the side window storage (see photo above) for books, climbing gear, etc, and then the storage inside the bench-bed for food storage and miscellaneous supplies like chalk (since we liked to stock up). It was just silly how many clothes we brought and never touched since we ended up wearing the same three outfits in rotation (Drexel basically wore the same zion prana pants for the entire five months). When your clothes get too stinky to feel okay about it, there are laundromats everywhere. The bottom line is – pack less stuff than you might originally think you’ll need. You’ll thank yourself for the extra space later. #3 – Have a fast, convenient way to boil water. Like a tiny tea kettle. Or those JetBoil things. Or anything else that does the trick of boiling water without lugging out all your cooking equipment. All we brought on our trip was a pot (for making pasta or quinoa) and a cast iron skillet for sauteing veggies. With only one big pot to use for everything, all of our oatmeal, tea and coffee had tiny flecks from last night’s dinner floating around. A small tea kettle would be faster and ensure that all we poured would be water. And that all we poured would go into the intended container, instead of splashing everywhere (our pot didn’t have a special lip for pouring ease). Do everything you can to make the morning process easier and calmer. If you can boil water for coffee and oatmeal without having to get out of the van, or even out of bed, you’re probably doing something right. #4 – Depending on where you want to go on your trip, having AWD could be essential. We survived on muddy and icy roads, but only sometimes from sheer luck. If we did this trip again, we’d either avoid sketchy roads, or choose a different vehicle. As it was, we slipped into an icy ditch on the way to Rocktown and got stuck in the mud in Arkansas. If you’re road-tripping in the winter and don’t have an AWD, be prepared to change your plans when the weather is feeling mischievous. Life doesn’t have to be expensive. Research ahead of time to find out how much it costs to climb at different places and plan accordingly (e.g. HCR is $5/day while the nearby Cowell is free). Find the cheapest (aka free) camping whenever possible. We made this easier for you with our Low-Down on Climbing and Camping, but you might need more extensive searching depending on where/when you’re going. When saving up money for your trip, just remember that food-wise you will probably spend $200-300/month (if you buy cheap groceries and also eat out a small handful of times). The only other expenditures should be gas (use this easy gas budget tool), climbing gear (e.g. chalk, replacement shoes) and then maybe bills from back home (e.g. cell phone). You might want to allocate a small budget for “fun” stuff, like riding carousels (don’t worry, most are 25¢ or 50¢) or expensive must-sees like the Tennessee Aquarium. Our trip ended when we ran out of money. It was also getting too hot to climb, so it worked out fine, but don’t let money be the sole dictator of your life. #6 – Be prepared for the season. #7 – If you’re a girl, you NEED a FUD. FUD stands for “female urination device.” I recommend the pStyle. Stand and pee. No fuss. ‘Nuff said. #8 – If you’re driving long distances, get a book on tape. We didn’t have one when we drove from Chattanooga, TN to Arkansas, and that was a looong car ride, I’ll tell you what. #9 – Driving, climbing, or hiking, stay very very hydrated. It’s easy to not drink water when you’re driving, but if you’re intending to climb the next day, you need to drink. We had one of those 5 gallon plastic jugs and were able to refill it everywhere we went (there are spigots everywhere – on the road leading to Rocktown and even out front of the grocery store in Joe’s Valley). Downside was that our water tasted like dirt or plastic sometimes. But no matter what, drink water. Drexel got dehydrated one day and it wasn’t pretty. Andrew drinks ten Nalgenes daily! Don’t be a Drexel, be an Andrew. #10 – Ten is a nice number to end on. Is there anything else we would have done differently? Sure. But so much of the journey is a process. Try to enjoy it. While you might shake your head at their silly ignorance, those folks raise a really good point: Why are you sweating and grunting your way up a rock using the most difficult route possible, when your eventual goal is to get to the top? Here’s where it might be important to take a minute to contemplate your goals and values of rock climbing. A goal is something that can be achieved, finished, completed. If your goal is to eat an 8 oz. chocolate bar, then you can buy one and stuff the whole thing in your mouth. Tada, done. Values are never completely accomplished. If you value consuming sugar, it’s not like you can cross this off your list after you demolish an ice cream sundae or snack on a snickers. After you finish your goal of a chocolate bar, there will always be more sugar to consume. So as you might be coming to understand, values are a direction, not a destination, and therefore are always available to you. At any point in your life, like right NOW, you can stop and answer the question “Am I headed in my valued direction?” even if you are not yet at your final destination. Take a moment to consider: What ARE your values when it comes to climbing? To be physically fit? To connect with friends? To seek inner peace? To be out in nature? There’s no right or wrong answer when it comes to values. Goals, unlike values, frequently involve planning and waiting. Let’s talk about Fred. While Fred’s value might be to be physically fit, his goal might be to climb a certain v10. Within this goal, there might be several steps such as working out each individual move or designating specific days of the week to working on the problem or drinking two full Nalgenes of water every morning. Several steps (or goals) might take place before the larger goal is met. However, all these goals are driven by the same value: physical fitness, which is a continuous direction. Every day that Fred reached for a goal, whether or not he reached it, he was living his values. So returning to the earlier example of people asking why you’re trying to climb a rock when there’s an easy hike around the back — If the goal was to get to the top of the rock, why would any of us climb? Although one is working to get to the top of the rock, the goal in climbing must be about the experience of climbing: feeling the wind in your face, laughing with friends, noticing the pleasurable strength of your body as you use it, and being in touch with the rock. If being a climber is what you care about and it’s about that very experience—falling off a climb and throwing a wobbler or finally sending a big project after months of hard work, then embrace the process. All of it, the good and the bad. As most of us know from experience, larger goals may not actually occur right away. All kinds of things can get in the way. The point is, by walking through the different steps along the way, you are participating in “value-driven” behavior, even if the “outcome” is not what we thought it would be. Feel free to share your values and goals in the comment section below. Learning more about finger injuries. Yay! With only four (now three) days left in Joe’s Valley, the heat is on. We had allotted one day per each area (Left fork, Right fork, New Joe’s, and Dairy canyon). Today was supposed to be my day to circuit New Joe’s in a last-ditch attempt to send everything we hadn’t been on yet. We headed to the Nerve Damage boulder first and I started climbing an easy V1 when I noticed pain in my left ring-finger’s A4. It was bad enough that my normally-stubborn refusal to acknowledge weakness conceded to the wisdom of not risking injuring myself any worse, and I hopped down. There’s no reason my impatience should exacerbate the situation. A real injury could end our road trip. So, what to do? 1) How to heal as quickly as possible. My mildly-educated guess based on what I’ve read is that it’s nothing serious, just a partial tear of the A4 pulley tendon which I bet is from the strange two-tiered two-finger crimp on Black Sea V8. No biggie. Based on the cumulative advice of these articles, my game plan is to REST (1-2 weeks until the pain subsides), ICE (putting my hands in the creek 2x day for 30 minutes), MASSAGE (once it stops hurting next week, begin a practice of massaging my fingers multiple times a day), and EXERCISE (refer to these rehab exercises from article #3). Feel free to share more ideas/articles in the comments below! Whether you are going on a weekend climbing trip, or perhaps a full-fledged year long road trip, there are certain items that should be packed, and others that would be better off left behind. Everyone has their unique needs, but this is the list we’ve settled on after 3+ months rock climbing and living in a minivan around the country. Disclaimer: I realize that I am not a professional climber. I don’t even consider myself very strong, just very determined. And yet I know that I can climb things now that I never would have imagined when I first started climbing. So somehow from the time I was struggling on V2s until right now, sending V7s, there has been progress. My muscles and mindset developed from an assortment of experiences over the past two years, but I believe I could have become a better climber sooner, had I but known a couple simple things. And thus comes the inspiration to write a letter to my beginner climber self, or rather, what I wish I had known about climbing when I first started out. We have created a Lowdown on Climbing and Camping page which will be continuously updated as we travel, and should be a valuable resource for anyone else who plans to camp out near climbing crags. Or rest. Or just climb in a new place. As of Feb 20, 2014, this page covers Horseshoe Canyon Ranch and Cowell in Arkansas, Rocktown and Little Rock City (aka Stonefort) in the Southeast, and Joe’s Valley, Utah. By the end of our road trip, this page will also have info about various places between here and there that tickle our fancy (e.g. Colorado, Squamish, maybe Leavenworth). And feel free to contact us if you have information to share about these – or other – climbing locations!